Situated in the heart of Clubview, with a public park as part of property, Clubview Tennis Club (CTC) is quiet, away from traffic and yet easily accessible from the N1 highway and Old Johannesburg Road. CTC offers Tennis for Everyone, no matter the level of playing ability. In addition, CTC also offers professional tennis coaching for those wanting to improve their tennis and for the more competitive tennis player. Whether it is competitive play or simply enjoying a relaxed Saturday afternoon with friends on the tennis court, CTC offers all these and more. Family is an important part of CTC and we would like to ensure that families feel welcome. While mom and dad engage in afternoon social, the little ones can either play in the sand of the beach tennis court or keep themselves occupied on the grass area at the club. Yes, it is THAT TIME of the year again when we splash out the Strawberries and Cream… WIMBLEDON 2017!! Members and their families, whether weekday or full member, are invited to join CTC in an afternoon of social tennis as well as watching the Ladies Final together on 15 July 2017. Strawberries and cream (courtesy of the Deuce Bar) will be served to ease those nerves during the Ladies Final! Social tennis will start as normal at 13:00. Surfs up in Gauteng. You will see that the club has amended the size of our Beach Tennis Court to that of the correct size for Beach Volleyball and Beach Tennis. The final sand is being arranged and shortly we will be taking to the “Beach” at CTC on a regular basis. This initiaitve is a project that TSA is launching and by CTC having a Beach Tennis Court, provides an opportunity for interested parties from Pretoria and Centurion to participate without having to travel to Johannesburg. 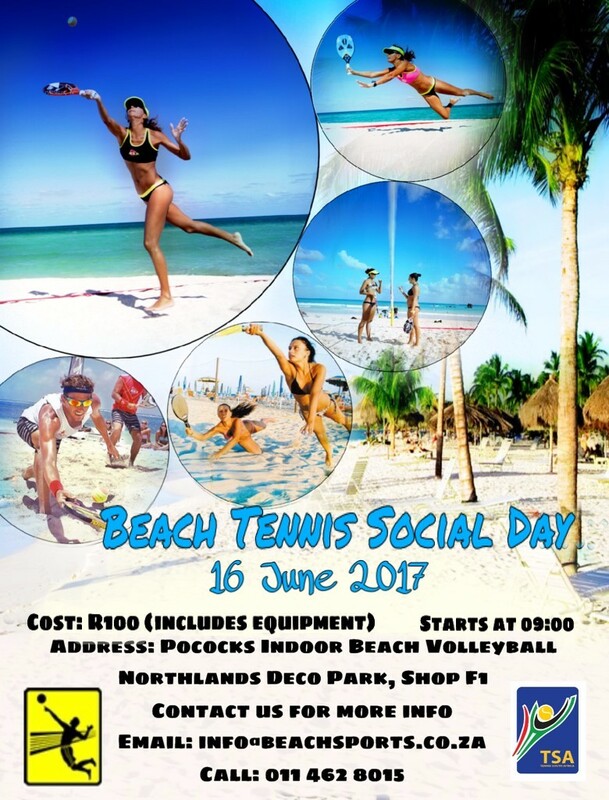 However, TSA have partnered with Pococks Indoor Beach Volleyball centre in Northlands and they will be having a social day on Friday 16 June for all interested parties wanting to play and try out beach tennis. Below (image) is the flyer and I can promise that there will be a lot more activities taking pace at Pococks and hopefully you will help support this initiative and at the club. Lets see how many members we can gather to go on a road trip to Pococks on Friday and have a fun time. There is no need to be able to play formal tennis to play beach tennis which makes it an ideal opportunity for family to have some fun together. Please see the flyer for Friday (image) below. Come on CTC lets hit the beach. We’re excited to announce that we will be hosting another tennis camp at Clubview Tennis Club during the July school holiday. Want to improve your game and learn more about tennis? We will be focusing on new techniques, improving game time, doubles, educational DVD’s and having fun! Suitable for: Juniors 8+ with ball skills. There will be a cash tuck shop and hot dogs or a bowl of soup with a bun for lunch to buy at R10 for Hot Dog and R20 for a hearty bowl of Soup and Bun. Alternatively contact our office on admin@jlstennisacademy.com. Clubview Tennis Club's News Archive. Congratulations to the SA Davis Cup Team. Een hekkie te veel vir Kevin. Nadal te sterk. Kevin (Anderson, not Curren) through to US Open final! Well done, Kevin Anderson! First time into semi-final at a Slam. Kevin Anderson is deur na die kwarteind van die Amerikaanse Ope. Your one-stop solution for graphic design, websites and other marketing.